Buildings throughout the historical center of Prague and even a bit beyond are bedizened with details, so many that it is easy to ignore them due to the sensory overload. 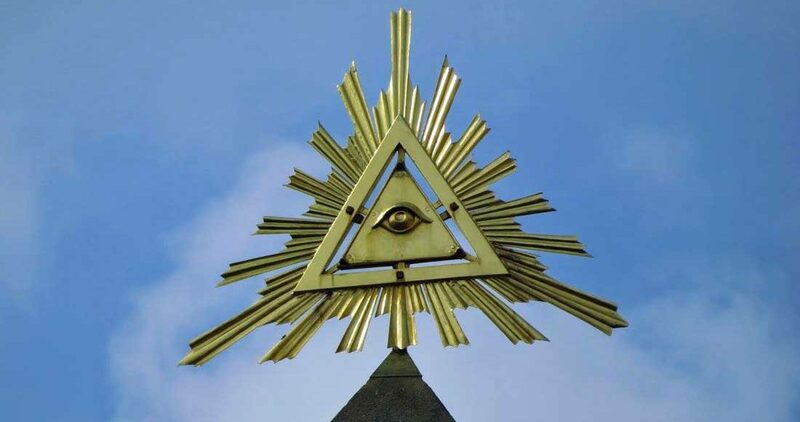 But once you start looking, it is easy to find themes and some say even hidden messages from secret societies. 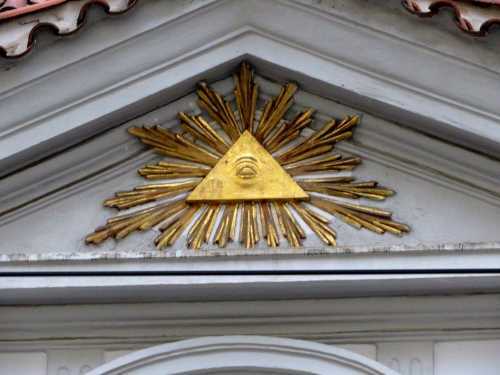 Once upon a time Freemasonry was popular among the elite in Prague, and a number of Masonic symbols such as the all seeing eye can be found on palaces and villas. 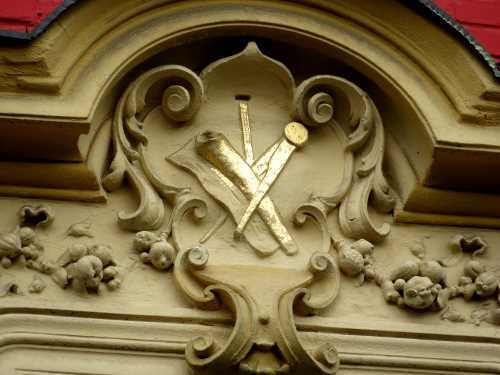 Two names in particular associated with the early days of Freemasonry in Bohemia are Count František Antonín Špork (Franz Anton von Sporck) and the noble Thun-Hohenstein family. 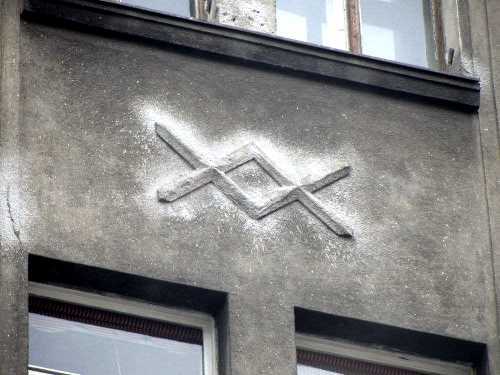 Both families had real estate holdings in Prague, and Masonic symbols can be found on some of them. 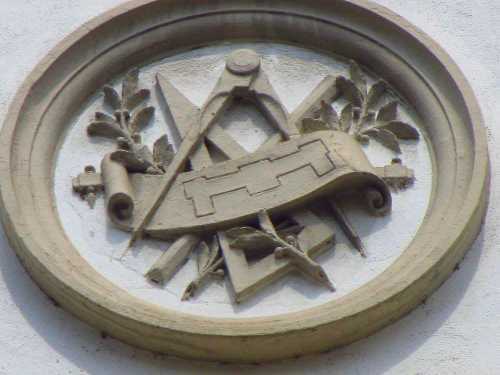 What is more surprising is that very specific Masonic emblems like the compass and square can be found on residential buildings from the late 19th and early 20th century. 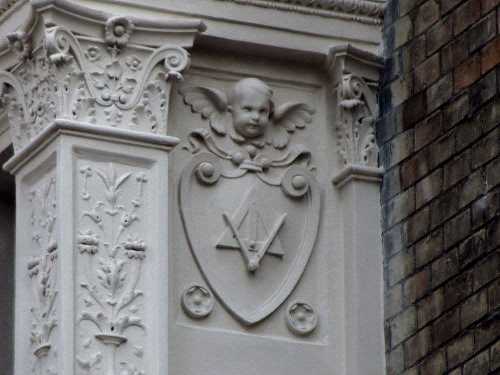 The meaning of these is a bit obscure, as the buildings were almost certainly never Masonic lodges. 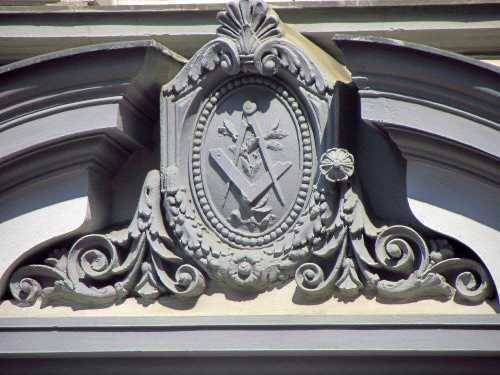 There is a gap after that as Freemasonry was officially banned starting in World War II and then also up through the communist era. One building has also wound up in esoteric fiction as a secret meeting place of the Prague branch of an Asian cult, but almost certainly this is the work of an author’s overactive imagination. Some signs may be just a coincidence, though. It is easy to wrap up the buildings and signs across the city into an unwritten Dan Brown novel, with some big hidden meaning at the end of the trail, but mostly the signs are just a curiosity at this point in time. 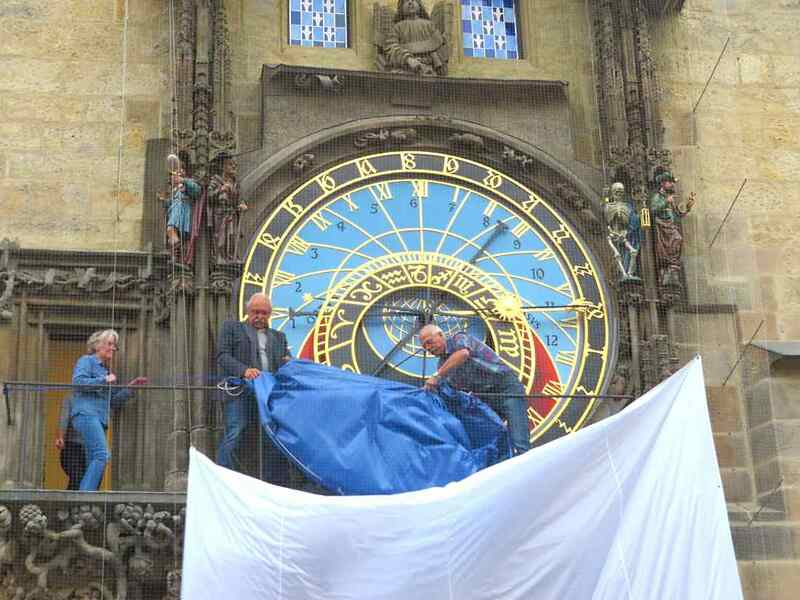 Dan Brown was in Prague in January 2014 on a vacation trip, but he did hold a press conference and didn’t rule out a novel set in Prague. It will be interesting to see if any of the buildings make it in to the story. The upper end of Šporkova ulice, or Sporck Street, in Malá Strana, has two elaborate buildings that are connected. No. 321/12 is known as Sporck Palace, and was in the hands of the family until the Count’s son Jan Karel sold it in 1777. On both No. 321/12 and the smaller No. 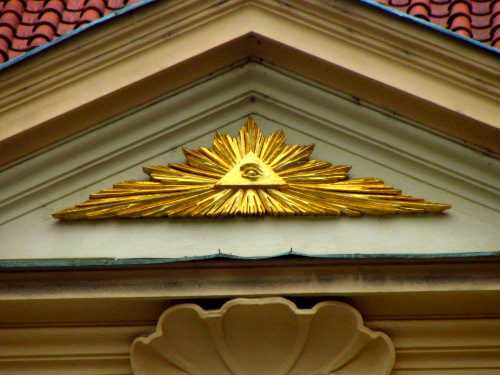 320/10 there is an Eye of God in a triangle. Sporck Palace is also known as House at the Two Golden Lions (U dvou zlatých lvů). Šporkova 320/10 is known as the House at the Most Holy Trinity (U Nejsvětější Trojice). 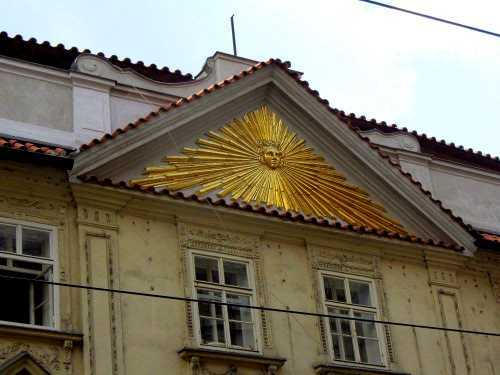 The family that used its Masonic connections to bring Wolfgang Amadeus Mozart to Prague, and tried to lure fellow Mason and pop scientist Franz Mesmer, owned Thun-Hohenstein Palace on Karmelitská Street, in addition to a more famous palace, now the British Embassy, closer Prague Castle. 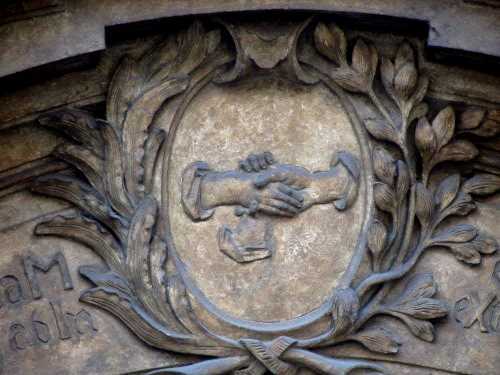 Above the portal of Karmelitská 379/18 there is a three-handed handshake. The different types of secret handshakes are a well-known aspect of Freemasonry. 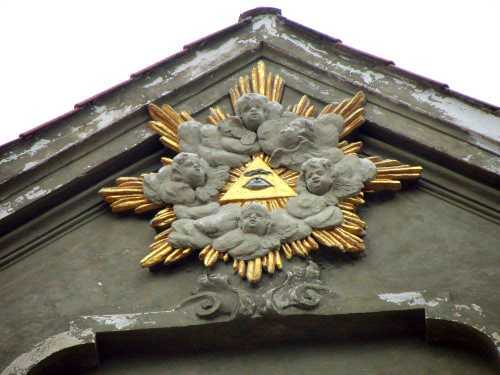 In the triangular pediment on top of the building there is an Eye of God with a Latin inscription. Thun-Hohenstein Palace, at Karmelitská 379/18, is also called House at the Black Lion and House at the Three Golden Hands. 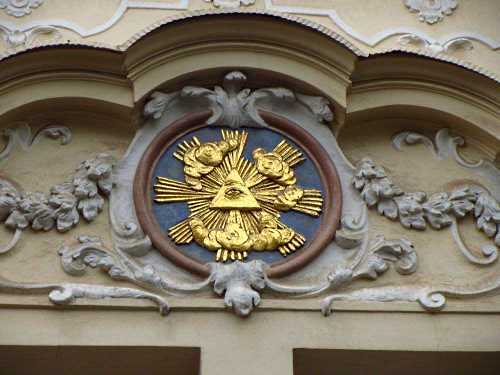 Two houses away, another building has an elaborate gilded Eye of God. 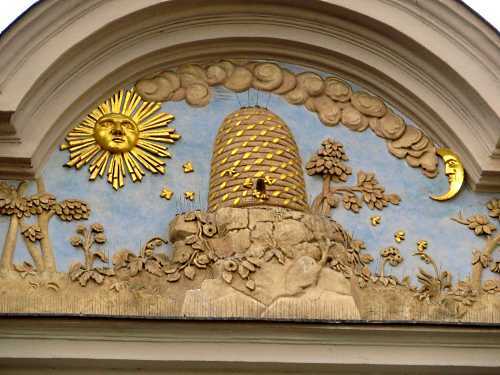 The symbol of the beehive is central to both Freemasons and Rosicrucians, another secretive society. The hive itself can be seen to represent a lodge or meeting place, and the bees as members. The symbol of industriousness is also important to both groups. The House at the Golden Hive (U Zlatého úlu) is placed prominently in between Wenceslas Square and Old Town Square. 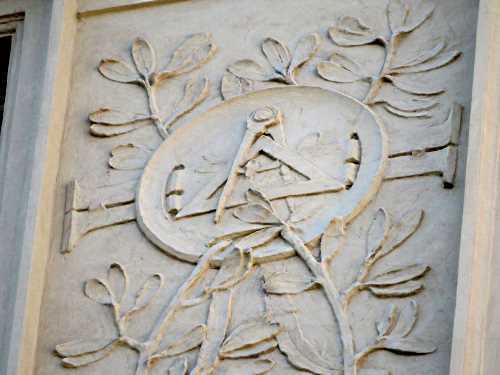 The hive is surrounded by two other symbols commonly used by both societies, the sun and the crescent moon. The beehive has been on the building since at least the 1700s. 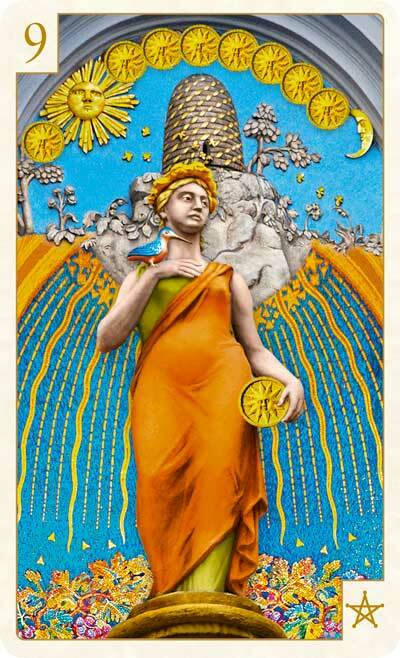 It can also be found on the background of the Nine of Pentacles in The Tarot of Prague. There it symbolizes industriousness and cooperation. 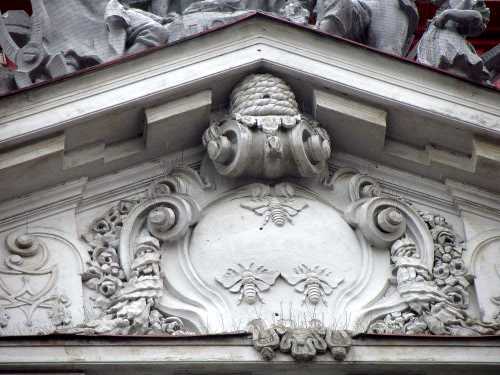 The beehive atop náměstí Republiky 7 is easy to miss. It is a small detail in a much larger design, squeezed into the top of the pediment. The building itself is from the 19th century and has served as a political party headquarters, a bank and an office building. 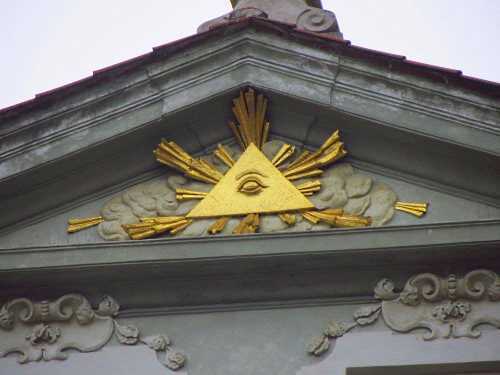 In addition to being on the Spork and Thun-Hohenstein places, the Eye of God, an eye in an often golden triangle, can be seen across the city. The same symbol appears on the back of the US $1 bill, and has long been cited as evidence of Masonic ties to the early founding fathers of the United States. 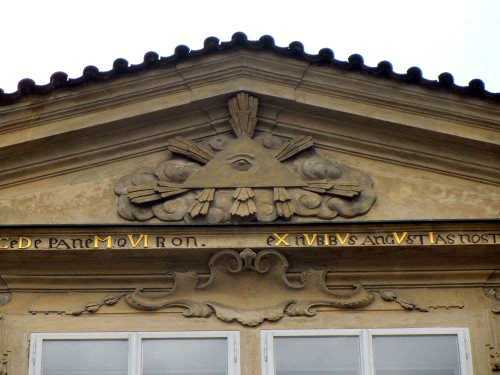 The most famous of the images in Prague is at the House at the Eye of God, also called the House at the Three Paintings. 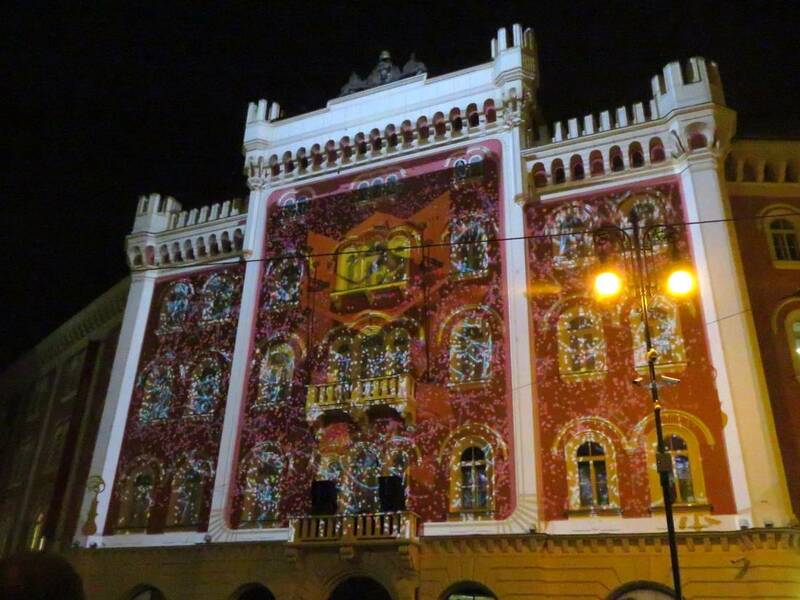 This building, Malá Štupartská 634/7, is right behind Ungelt, the former customs house for Old Town Square. 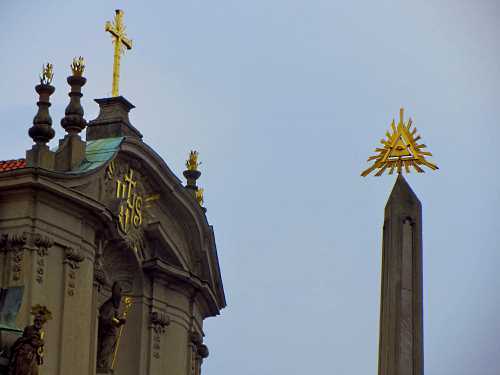 An Eye of God is also atop a pillar in Malostranské náměstí, bu as this is next to a church it may just be a religious symbol. A bright golden one is at the top of Nerudova street, poised to look all the way down at the people walking up. Nerudova 171/48 is called the House at the Three Stars, At the Three Kings and At the Three Miners. 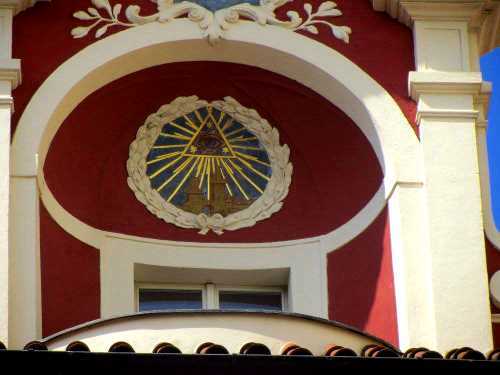 The house at Spálená 81/8 in New Town was built in 1784 by architect Pavel Wiedhoff or Wiedhopf as a parish house for the Church of the Most Holy Trinity and features a golden eye in a triangle, likely going along with the theme of the church. Part of the building was turned into a private home for a church caretaker in 1881. The House at the Golden Sun has the entire face surrounded by triangular rays. Whether or not this truly fits in as an Eye of God is debatable, but it is an impressive image if one looks up to see it at Na Poříčí 1045/22. 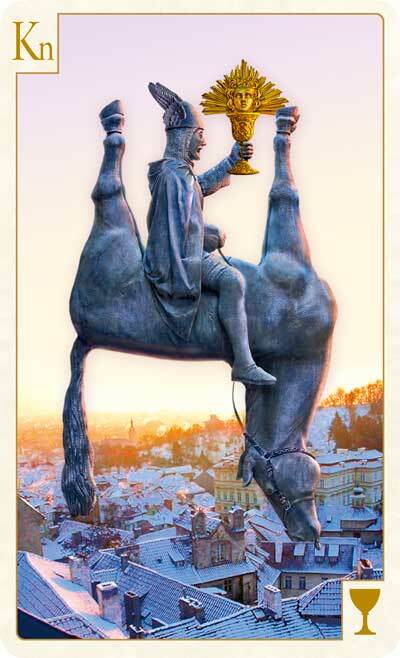 The image of the face surrounded by sun rays at the House of the Golden Sun appears on the Knight of Cups in The Tarot of Prague deck, where it symbolizes a dream. Masonic rings and seals and other insignia often carry an interlaced compass (the kind for drawing circles) and a square angle or triangle. There are two very colorful ones on modern residential buildings: Vinohradská 1233/22 in Vinohrady and Náměstí Kinských 7 in Smíchov. 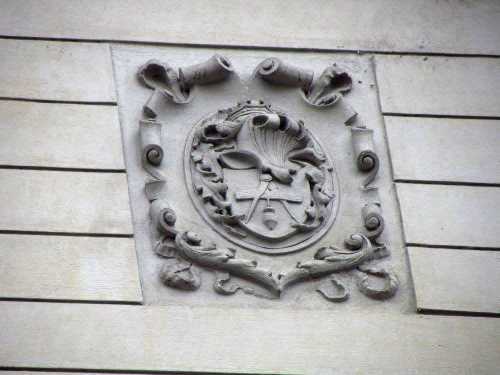 A nice one on the side of the former Secondary Engineering School (Střední průmyslová škola strojnická) may simply refer to drafting and architecture, as other symbols on the building clearly refer to academic studies. Others are on residential buildings and a hotel in the Old Town, New Town, Vinohrady, Nusle and Holešovice neighborhoods. 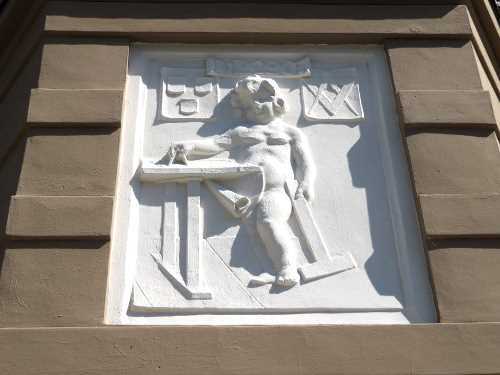 An unusual one at Šmilovského 1430/2 in Vinohrady on an apartment building builtin 1907 shows a naked boy with a square and compass, and the same symbols in a shield. 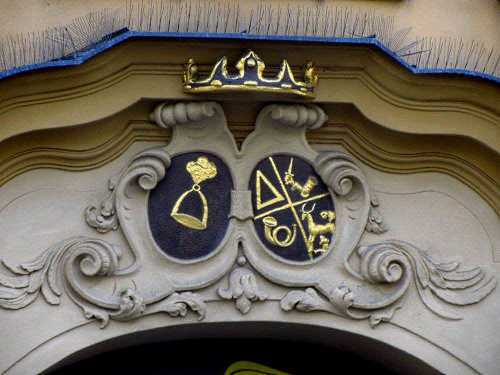 A naked boy with the symbols is also on an elaborately decorated neo-Gothic building on Vinohradská 1233/22. A residential building in Old Townon a corner with tow addresses, Havelská 31/494 and Železná 22/494, is reputed to have been a Masonic headquarters. 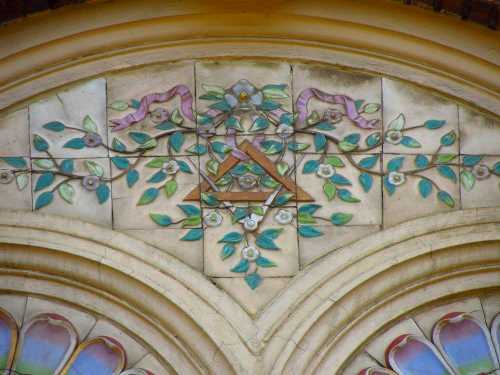 It has a compass and triangle on its facade, as well as a rose. 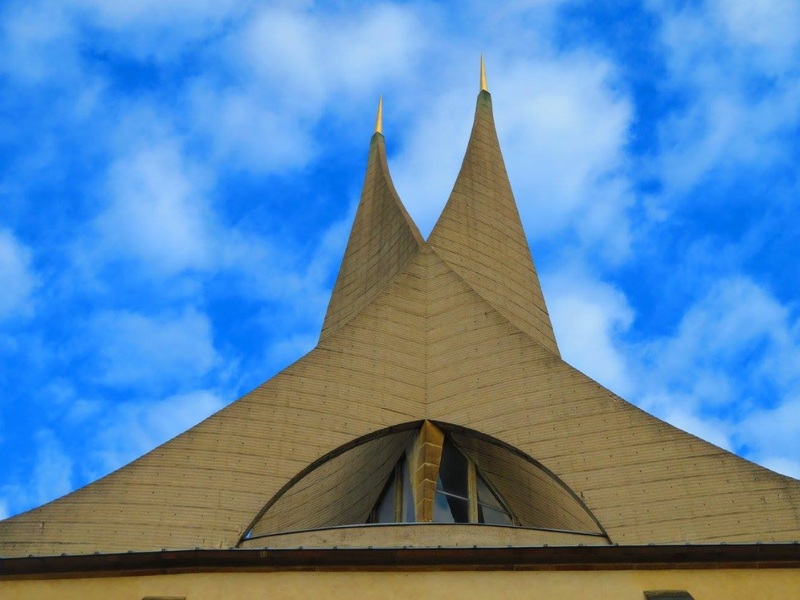 Some, like the intersecting angles on Lublaňská 652/53, are debatable. 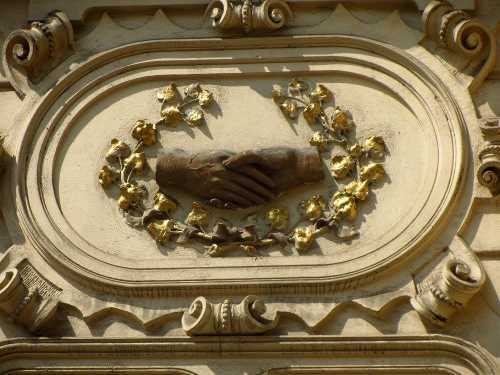 The handshake on Na Zderaze 1947/3 may be a Masonic greeting or a symbol of international friendship, as other decorations on the building are international in nature. 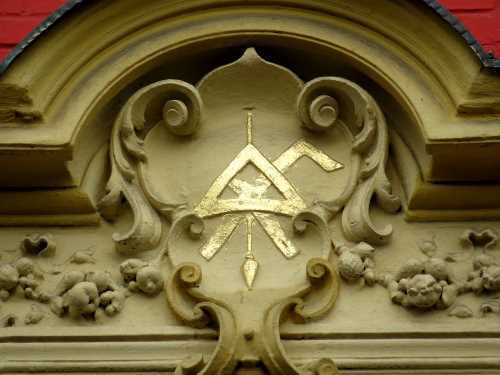 The odd assortment of symbols on House at the Golden Pillar at Vodičkova 680/16 is sometimes called Masonic due to the triangle. Austrian-born writer Gustav Meyrink, who drew his inspiration from Prague, wrote around the same time as Franz Kafka, but focused on more esoteric and symbolic stories and is most famous for his novel The Golem. 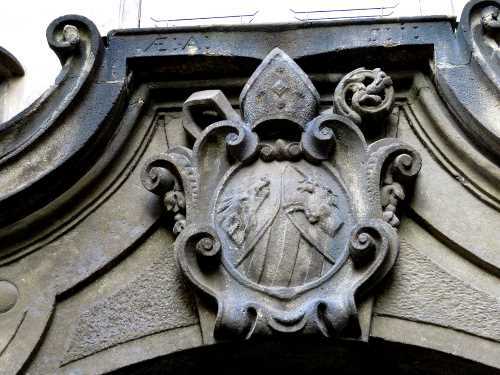 In several other stories he linked the stone escutcheon above the portal to the former bishop’s palace on Opatovická 158/20 in Prague’s New Town to a mysterious secret group. The escutcheon depicts a boar and a unicorn, symbols of wild virility and virginal purity, topped by a bishop’s miter. Meyrink in his fiction claims it is the symbol of a secret society called Sath-Bhai, or the Asiatic Brethren. The name relates to a Masonic legend of seven monks who established an order in India and who later sent emissaries to Prague. While it is charming to think this, the escutcheon has a more mundane explanation. 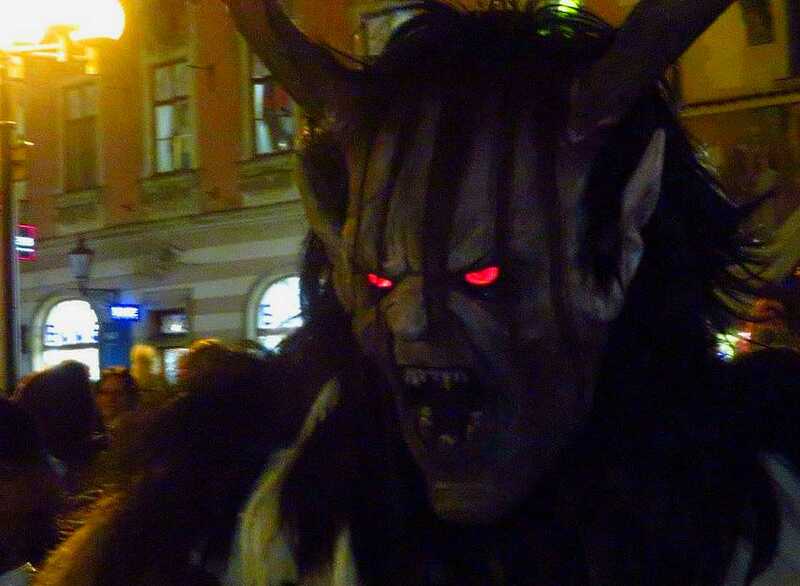 It is connected to the Monastery of St John Under the Cliff, near Beroun, just south of Prague. Abbot Koterovsky, who was involved with the monastery and also renovated the New Town palace, known as House at the Bishop’s Hat, used it as his coat of arms.